Clos de la Tech is a name derived from the Burgundian word for vineyard or “clos” which means enclosed area, or more specifically, refers to the rocks that were removed from the land to form a stone wall around the vineyard. The "tech" part of the name is a reference to the owner’s tech background and the silicon chips on the neck of every Clos de la Tech bottle. In 2002, the latest release, two real silicon memory chips with 1.02 billion transistors on them are on each bottle (at $0.0000001 per transistor, that’s $102 in value, making the wine free!). Semiconductor pioneer T.J. Rodgers (CEO of Cypress Semiconductor) and his longtime domestic partner Valeta Massey have begun a project in the Santa Cruz Mountains to produce the best Pinot Noir in the world. 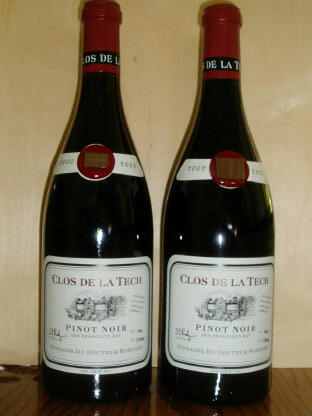 Clos de la Tech was founded in 1994, and currently produces about 125 cases of Domaine du Docteur Rodgers Pinot Noir, priced at $101 per bottle. Rodgers plans to gradually increase production as his vineyards develop, eventually reaching 13,000 cases. Rodgers has three vineyards planted in the Santa Cruz Mountains region - Domaine Docteur Rodgers, Domaine Valeta, and Domaine Lois Louise. Domaine Docteur Rodgers is a one-acre vineyard adjacent to Rodgers’ home in Woodside planted to Dijon clones 113, 115 and 777. Close-spacing of vines and small yields are the norm here. The first Clos de la Tech wines were sourced from this vineyard beginning in 1996. The Domaine Valeta vineyard is 3 1/2 planted acres on a 30-acre site perched on a peak at 2,300 feet looking down on Silicon Valley. This is a colder site, producing wines that are more tannic and aromatic than those from Rodgers. The first wine made from this vineyard is the 2002 vintage, to be released in 2007. Domaine Lois Louise, named after Rodger’s mother, is a 25-acre ridge-top vineyard within a 160-acre parcel in the hills above La Honda. This is probably the steepest vineyard in California. The first wine produced from this vineyard was the 2004 vintage. Eventually, 80 acres will be planted here and the wine will be made inside three 300 ft. caves blasted out from the hillside. It is hoped that a number of distinguished microclimates will be identified within this ridge-top vineyard, allowing the bottling of unique “grand cru” quality wines from separate blocks. There is no intention of blending grapes from the vineyard to produce a communal wine. Because of the challenges of farming this vineyard with its variable and double slope topography, Rodgers has designed a special tractor that runs on cables and can be controlled with a joy stick. The vertical slope in places is a jawdropping 66% and the horizontal slope is simultaneously 25%. It is the only tractor in the world that will accommodate large vertical and side slopes at the same time. 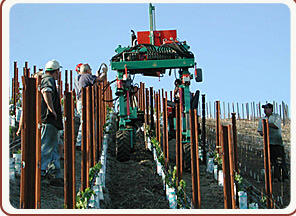 Vineyard manager Rex Geitner, who has managed vineyards at Stag’s Leap Wine Cellars, Domaine Carneros, and Robert Keenan Winery, oversees the vineyards. The rows are very tightly spaced at Domaine Lois Louise, and vine spacing is minimal, with about 4,000 vines per acre. Because of the cooling effects and exposure to the Pacific Ocean, disease pressure is high and the project will not be totally organic. Farming here is definitely high-tech, but winemaking is very traditional in the Burgundian mold. Rodgers employs whole-cluster fermentation, sur lie aging, and foot-crushing. Careful scientific monitoring is employed, however, and winemaking decisions are made both on taste and chemical measurements. The new winery facility at Domaine Lois Louise will utilize gravity flow and plans are to install 56 fermentors to allow simultaneous fermentation of multiple eight-barrel lots of wine. A special press was designed by Rodgers that can be moved to the tank and must without separating the press and free run juice. The result is that he can use both in making the final wine. 13% alc., 101 cases, $101.50. · The exotic nose features cherries and rare woods with a touch of heat. The mouth feel is fuller than the 2000 vintage and there is more fruit with spiced cherry, plum and chocolate flavors. The finish is tart, but has more acceptable acidity. 13% alc., $101.50 · Light in body, this delicate Pinot Noir has aromas of super ripe fruit tending toward prune with a touch of herbs. The flavors of tart cherry end in a finish with searing acidity. I cannot relate well to these wines other than to compare them with some older Burgundies I have had. They will have limited appeal to those fans of the plush style of California Pinot Noir. It will be interesting to monitor the future wines as the two newest vineyards come online. With the passion and resources (Rodgers has spent more than $20 million since breaking ground at Domaine Lois Louise in 2001) that Rodgers has at his disposal, his future success is likely. Although Rodgers and Massey have no formal training in enology or viticulture, it is a given that the science of winemaking can be learned and gifted people often find success as vintners. This is a fascinating and innovative project to keep your tabs on. Up to now, the Clos de la Tech wines have been sold to a small group of Rodger’s friends and a tiny mailing list. As more wine becomes available, the options for purchasing will increase. Visit the website at www.closdelatech.com for more information.